Tips for Combating Compassion Fatigue-- what happens when compassion fatigue sets in, leaving you burnt out and unable to feel for your clients? Join us on October 19th for a one-hour online seminar that offers you the tips and strategies you need to combat compassion fatigue in your practice and your life. 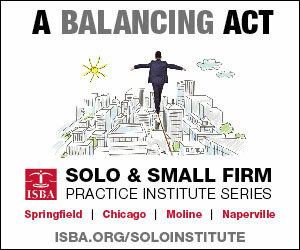 Go to https://www.isba.org/cle/upcoming for details and registration information. Now you can see just how valuable section membership is! Go to www.isba.org/sections and click on any section's prospectus to view what they accomplished during the 2015-2016 bar year. Learn more about this Committee's activities and hard-working members. Spotlight on REM members (and past members! ): What a Guy—He Never Stops Giving! REM Committee member Cory White was recently elected by the ISBA's Board of Governor's to the position of Delegate to the American Bar Association. Explaining legal issues and court proceedings to the public and having a public who is educated about the legal issues which the courts face every day can only lead to a better court system overall and more trust in the system as a whole. Recently appointed judges J. Imani Drew and Geraldine D'Souza have followed fascinating paths to their present positions. While Congress’ concern about drug abuse in America is justified, a major concern with mandatory minimum statutes like the CCEA, is the probability that it is applied disproportionately. Arguably, the CCEA is applied almost exclusively to minority groups. The case, Omid Shariat Razavi v. Eva Walkuski and Ariel Zekelman and School of the Art Institute of Chicago, furthers the protections afforded to those students who report their attackers to school personnel.